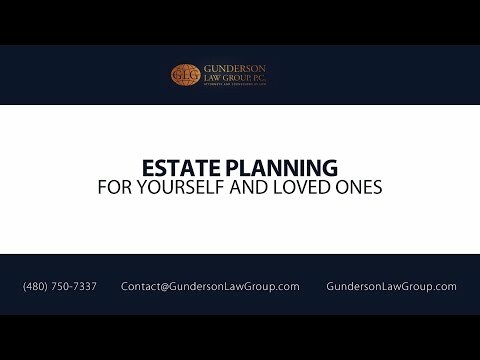 Estate Planning For Young Families | Gunderson Law Group, P.C. There is a common misconception that only wealthy families with a lot of property need an estate plan. This may have something to do with the term “estate” which often conjures up images of vast tracts of land or complex assortment of family assets. In reality, the word “estate” is simply a term used to refer to a person’s property—no matter how extensive. While the estate planning needs can vary widely from one family to another, nobody needs a good estate plan more than a young family—especially a young family with minor children. For example, what would happen to your family and to your family’s assets if you or your spouse were disabled for an extended period of time? If something were to happen to you, who could care for your minor children? And even if you haven’t accumulated a significant “estate” yet, what will you do to protect the property that you do have to maximize your ability to provide for your self and your loved ones? Life can be unpredictable, but planning ahead can make even the most difficult times more manageable. In the event that you become so sick or injured that you are unable to make healthcare or financial decisions for yourself, who should step into your place to make those important decisions on your behalf? If you could, what kind of instructions would you give that person? With a good estate plan, you can designate an “agent” you trust and authorize that agent to act on your behalf, and you can narrowly tailor your plan—to limit or broaden the authority of your agent to act on your behalf. Typically, this type of a plan will include (at least) a Durable Power of Attorney and a Health Care Power of Attorney. The Durable Power of Attorney authorizes an agent to manage your property, while a Health Care Power of Attorney authorizes an agent to make medical decisions on your behalf. Sometimes, you may want to provide a more specific set of instructions on the way your chosen representative will manage your affairs. This can usually be accomplished through a living trust agreement—wherein you authorize a “trustee” to manage your affairs according to the terms of the trust agreement. If you have minor children, planning for your children’s care is likely the most important part of your estate plan. If you and/or your spouse are gone or incapacitated, who do you want to take care of your children? Parents who plan ahead can designate the person (or people) they want to serve as the guardian(s) for their children. This is often done through a parent’s will. Parents can provide additional instructions in a more complete trust-based estate plan. For example, raising children after the parents have passed is often a team effort. One family member may be particularly well-suited to provide the day to day care for the children, while another family member is better suited to manage any available funds. In these situations, your will might designate the guardian who should provide the daily care your child needs, while the trust designates a trustee and provides instructions on how funds should be used for the children’s needs. Young families generally have not had enough time to accumulate significant assets. Some families may never accumulate the size of an estate that requires an extremely sophisticated plan. But your “estate” is small and you don’t need a complicated estate plan, there are some things you implement in your own estate plan, to efficiently manage and protect what assets you do have. For example, many young professionals have life insurance or disability insurances benefits that are provided by their employers. Smart families obtain these types of policies, even if their employers do not offer them. In most young families, one spouse will typically name the other spouse as the primary beneficiary for one of these insurance policies. But what should happen if you and your spouse were to pass in a single tragic event? In these difficult situations, you probably want any available insurance money to be allocated to take care of your children. If you leave no plan in place, the courts will inevitably need to get involved to appoint a conservator to manage the money for your minor child(ren). The court, then, is forced to make life-altering decisions for your children without your guidance. Additionally, this process can be very expensive and time consuming—wasting valuable resources on court costs and attorneys fees. To minimize these risks, parents can arrange their estate plan in a way that directs any insurance money to a trust for the benefit of their children (and/or other beneficiaries). The trust agreement can provide instruction on how the money should be managed. This can help reduce the costs associated with managing any remaining assets. A trust can also provide some significant creditor protection—helping to ensure that the money is preserved for the benefit and any later beneficiaries. In addition to insurance policies, you may have other assets for which some basic planning could greatly benefit your loved ones. For example, young families who purchased a home in the last 6-7 years have likely seen a significant increase in their home’s value. As a result, even some very young families have a built significant wealth in the form of equity in their homes. This can be an important asset in any estate plan. A well-crafted estate plan will provide the necessary instructions (and appropriate level of flexibility) to allow whomever you designate to properly manage your assets for you and your loved ones. Of course, every family is unique, and there can be no “one-size-fits-all” plan. This means that however you decide to plan for you and your loved ones, you should consult with a professional that you trust to ensure that your plan gets implemented properly. Contact the attorneys at Gunderson Law Group today.